Nobody in the world loves locking people behind bars as much as Americans do. We have more people in prison than any other nation on the planet. We also have a higher percentage of our population locked up than anyone else does by a very large margin. But has all of this imprisonment actually made us safer? Well, the last time I checked, crime was stillwildly out of control in America and for the most recent year that we have numbers for violent crime was up 15 percent. The number of people that we have locked up has quadrupled since 1980, but this is not solving any of our problems. Clearly, what we are doing is not working. To keep people from committing the same crimes should we just lock them up even longer? #3 The incarceration rate in the United States is more than 4 times higherthan the incarceration rate in the UK and more than 6 times higher than the incarceration rate in Canada. 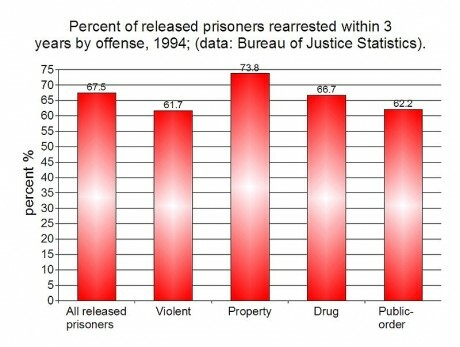 #5 Overall, the United States has the largest prison population and thehighest incarceration rate in the entire world. #8 The state of Ohio (total population 11.6 million) has more people in prisonthan Pakistan (total population 192.1 million). Most people will not hire them, and in many cases public assistance is not available to them. Often their wives and families have abandoned them, and they have no roots in their communities after being away for so long. Without any options, it is really easy for many of them to fall back into crime. And that is the last thing that we should want to see happen. In the end, the truth is that none of us is perfect. We all need grace and we all need forgiveness. Perhaps we should remember that.